Each year, with my fourth graders I work with the FOSS Magnets and Electricity Kit. It is one of my favorites I use with any of my Kindergarten through fifth graders. I love the discovery aspect of what each lesson can pose. I love the supplies that are in the kit, but I don't often love the lack of connections that it makes with the real world. After attending the NSTA (National Science Teachers' Association) Conference last week, it reaffirmed the importance of story telling to make connections with our learners. Why are they doing an activity? What can they take away from learning a particular lesson? How can they connect to the information to retain it? The electricity portion of FOSS is pretty good...we learn about circuits, but we add energy sticks to get a whole group participation and understanding of open and closed circuits...the small investment is big bang for your buck! Letting students "discover" electricity is also an amazing ahaha moment in a classroom. 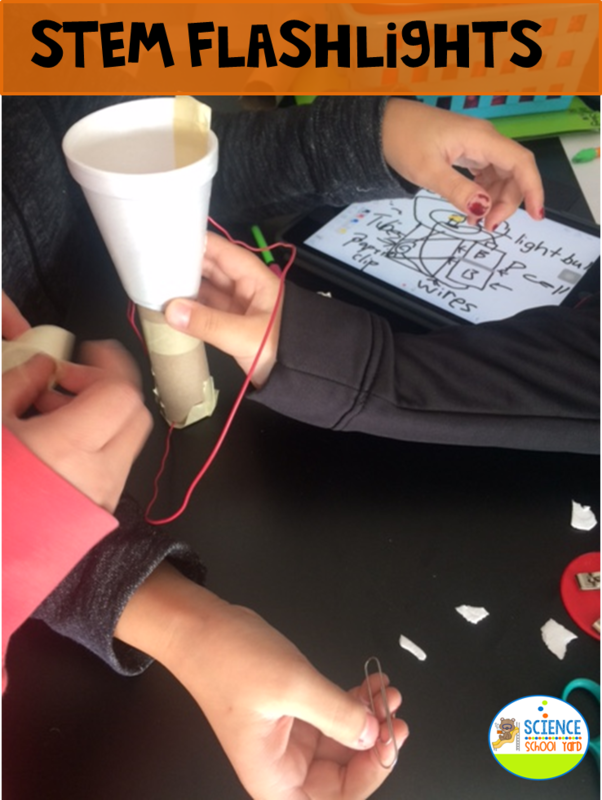 Allowing them to find out how to light a bulb with a conductor, insulator, and source is key to their success in knowing how it all works! Let them "play" so that in the end experts can help novices and if you have an ipad it is also a great opportunity to have them video and record their results. We use Explain Everything App to do just that! Not only can they go back to see how to set up something they did the lesson before, but they can use it to study from. I also love the idea of using our iPads to review what we know about a concept. 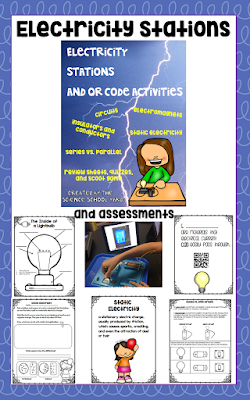 When it comes to electricity, we use FOSS and my Electricity Unit and Resources Pack! I love the flexibility both give me to use the supplies in the FOSS kit, but utilize my sheets to teach the "BIG Ideas" such as parallel and series circuits, conductors and insulators, static electricity, QR code game review, and electromagnets to just name a few topics we cover using both resources! What I love is the new STEM activity that I added after going to the NSTA convention. I was inspired to make a story connect to what lessons we have to teach in our classrooms. I gave them supplies that I found in my car as I was camping...but I forgot the flashlight and I need something to light my way! What could I do to make a flashlight? What an amazingly fun STEM challenge and with their background in circuits as well as conductors and insulators they were up for building a Macgeyver like flashlight! This was perfect for a formative assessment of what they knew! I have also found when I need to review a concept, giving the students the ability to work independently on a review by using a qr code and link on Google Slides helps them not only review, but check their work immediately. I even found that if I want it to be used as a formative assessment check point I can put the slides on my smartboard and have them answer the questions by circling their answers and having me check their work. 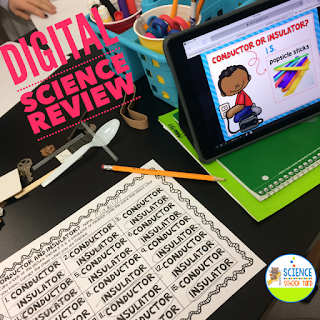 Using all of these different hands-on activities such as the Digital Conductor and Insulator Review Pack has given me the flexibility to have my learners have multiple opportunities to show what they know! From discover...to experimenting...to assessing through QR codes or digital assessments their schema is building and that is what we want! Use what you have to make those connections in any unit that you are working on...what supplies are available is the start... how can you make it make sense is up to you! I would love to hear what fun activities you add to your electricity unit!! !